Ginger root is a well-recognized health marvel, mending everything from inflammation to cancer to diabetes. But did you know that it can also improve brain function? In our demanding world, acute cognitive ability is essential. Fortunately, ginger is an outstanding ally in the quest for enhanced memory and clarity. Moreover, it plays a substantial role in guarding against brain oxidative stress and neurological disease. And there's more. Current research has shown ginger can help make you smarter and protect against neurological afflictions too. Research published in Evidence Based Complementary Medicine found that the consumption of ginger by middle-aged women improved cognitive ability. Sixty healthy participants were randomly given either a placebo or standardized ginger extract (400 and 800 mg once per day) for two months. The volunteers were then evaluated at the one and two month mark for memory and cognitive function. Those who received the extract demonstrated a considerable increase in memory, while brain oxidative stress was reduced. Another study discovered ginger root helped minimize monosodium glutamate (MSG) neurotoxicity. After male albino rats were given a daily dose (4 mg/per kilogram) of pure MSG for thirty days, a significant decrease in the hormones epinephrine and norepinephrine along with the brain neurotransmitters dopamine and serotonin was observed. However, when an injection of ginger root extract (100 mg/per kilogram) was given for the same length of time, the hormones and neurotransmitters significantly increased. 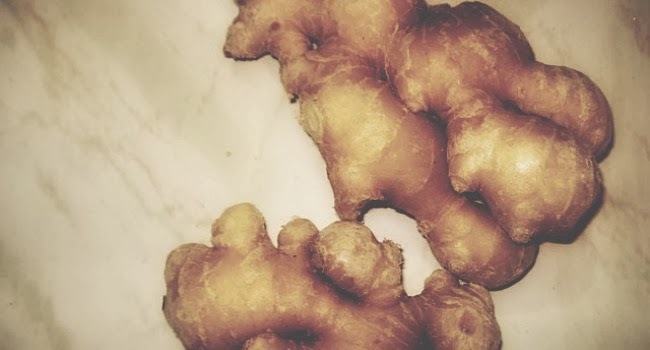 Researchers then found that when both were administered simultaneously, the extract mitigated the damaging effects of MSG - leading the team to conclude that ginger acts as a potent protective agent. As an excitotoxin, MSG is linked with Alzheimer's, multiple sclerosis, Parkinson's disease, autism and attention deficit disorder. Whether contending with age-related cognitive decline or toxic food additives, ginger is an exceptional protective root. Including it in your daily diet is a powerful health affirming habit. Use it as a flavorful spice in cooking, freshly brewed as a tea or in extract form to help preserve brain and nerve health now and in the future. Thanks Fawayed for the link and stopping by. Have a terrific week! This cites injection as the method by which the ginger is used/given. If I injected Tylenol, it would stop my migraine too.